If you can’t take the hate, get out of the convention. You might as well put that bad boy in Poor Richard’s Almanack because it’s the God’s honest truth. At least it is for me. I couldn’t force myself to watch Paul Ryan’s speech last night because, at a certain point, you just run out of disgust. You grow numb to it all. So, I’m just not going to deal with it. Instead, while the entire Republican party is pretending George W. Bush never existed, I’m going to focus on a candidate for president who can actually bring about the change we need. Barack Obama is a brilliant politician and statesman, but he is most assuredly not that candidate. Unless the change you were voting for four years ago included thousands of drone strikes, billions in bail outs to big banks and a complete failure to acknowledge that there is a thing called poverty in this country. He’s not a bad man by any stretch of the imagination. He’s just the status quo in a suit. The only candidate in this election that provides me with the hope that some day we might resurrect the beauty of 20th Century progressivism is Jill Stein, the Green Party nominee for president. If you’ve never heard her name, you’re not alone. 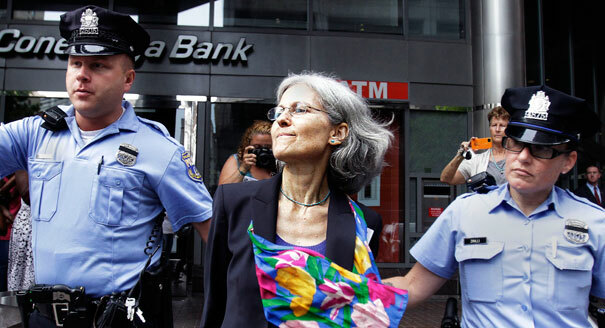 Stein is a Massachusetts physician who has a relatively short political CV and has long been a supporter of progressive causes. She, along with people like Gary Johnson and Rocky Anderson inhabit the island of misfit candidates. It is a strange and wonderful world where there are more than two political parties and candidates speak their mind rather than what their handlers believe the public wants their mind to be. Stein isn’t invited to any televised debates. She doesn’t have the money for major market ad campaigns1 (yet) and she doesn’t take a cent of corporate cash. What she does have is a campaign that’s worth listening to and a platform that can take us out of the Reaganite dark ages in which we find ourselves. The crux of Stein’s plan for America is in what she and her running mate Cheri Honkala have dubbed The Green New Deal. It is what it sounds like and I’d imagine it’d make Grandpappy Roosevelt mighty proud. Stein is running on the promise of a new economic bill of rights that would give Ron Paul a heart attack. She wants to guarantee gainful employment for every American through the creation of a nationally funded, but locally directed jobs bank that can pick up the slack whenever the private sector goes limp on us. As their party name suggests, Stein and Honkala are huge advocates for sustainable green energy and a green economy. Through new green infrastructure they hope to create millions of new jobs while reducing our nation’s carbon footpront. The Green New Deal also promises a living wage for everyone and emphasizes protection of worker’s rights over corporate profits. Oh, did I mentioned she’s going to tell the banks to get bent? Stein wants to break those godless behemoths up into manageable chunks and actually enforce financial regulations on them. Bring back Glass-Steagal and end all of this taxpayer-funded bailout nonsense. I don’t know about y’all, but I’m a little cross that the banks that we lent money to are posting record profits while the American economy is still an emaciated husk of its former self. To quote the great and honorable Dubya, fool me once, shame on, shame on you. Fool me twice, uhhh, ain’t gonna fool me again! Next time the banks need bailing out, sorry, you’re a public bank now. Should’ve managed your money better. A large portion of the Green New Deal is devoted to restoring the civil liberties that have been taken from us over the past few decades. Patriot Act? Gone. Suppressive aspects of the National Defense Authorization Act? We don’t need those either. As a matter of fact, since the United States spends more on national defense than the next 25 highest defense spending nations combined, it makes sense that we should cut the ever-loving hell out of it. Stein must agree with me because she advocates for cutting US military spending in half to a meager $350 billion a year. The rest of the platform is basic crap that we assumed we fixed in the mid-sixties with the Civil & Voting Rights Acts. You know, tenets of basic human decency advocating against discriminatory policies and demanding the right to vote for everyone. I’m pretty sure that if you’re still reading this, you’re liberal enough to consider voting for a Stein/Honkala ticket. However, I can already hear the chorus of Eeyores saying “you’re just throwing your vote away” and “you might as well vote for Romney.” Well, here is my response: I’m already throwing my vote away by living in the true blue state of Maryland thanks to our demented electoral system. As a matter of fact, unless you live in Virginia, North Carolina, Florida, Pennsylvania, Ohio, Michigan, Wisconsin, Iowa, Colorado, Nevada or New Mexico, then your presidential vote doesn’t mean a damn thing either. Our system is beyond broken and the illusion that we are a democracy has all but vanished. If you want to vote for Mitt Romney or Barack Obama because you support their policies and identify with their vision of America, then mazel tov. But, if you’re voting for either of those bought and signed for men for president because he’s “the lesser of two evils”, you’re doing yourself a disservice. When we vote for someone because he or she is less repugnant than the other guy, all we’re doing is giving up our capacity to dream. Our only choices are not sink quickly or sink slowly. I’m not operating under the pretense that Jill Stein has even a puncher’s chance at winning the presidency, but I’m supporting her in November because I can turn in my ballot knowing I believe in the principles and priorities of woman I just voted for. I do feel the need to relate one story in closing that got little media attention, but says more about Jill Stein than any Super PAC ad could have. Earlier this month, Stein and 50 others organized a sit-in outside of the Philadelphia headquarters of mortgage giant Fannie Mae to protest their foreclosures of two homes belonging to impoverished families in the area. The bailed out mortgage company refused to renegotiate their payment plans and wouldn’t halt foreclosure proceedings like the federal government and American taxpayer did for them four years ago. When Fannie Mae would only send down token low level employees to talk to the group, Stein and company sat down in the lobby of the building in protest. Dr. Stein and VP nominee Honkala were then arrested by the Philadelphia Police and taken down to the station with some other members of the protest group. I have to say, it is a beautiful thing to see a politician who is willing to get arrested for an act of non-violent protest. Any presidential candidate civil enough to be civilly disobedient can count on my vote.